We do lawn seeding and sod installation. It takes about 3 years to establish a healthy lush lawn with seed and fertilizer. Sod on the other hand, provides an instant lush green lawn and is more cost effective than many think. Seeding requires excellent soil conditions and good watering habits to fight off the heat during summer months. It is also crucial to control weeds so that the new seedlings can use the nutrients to form a lush lawn. Contact us today for a free estimate on sod. 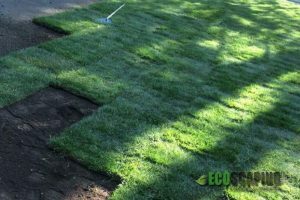 If you’re looking to grow a new lawn with seeds or sod, contact Ecoscaping Landscape & Construction today to have us assess your soil and come up with a lawn plan for your property.